Click here to go to the state’s Website of inspections … and the listing of the violations at each location. The statewide directory lists inspections for all municipalities in York County and Lancaster County. … except those in Columbia – Columbia persists in having its own inspection system with its own forms and inspection items – rather than the one used statewide. So will Columbia’s home owners take it in the shorts with the POTUS proposed income tax reform? In spades, with the elimination of real estate taxes and more. Read more in the page one lead article at LNP – Always Lancaster. 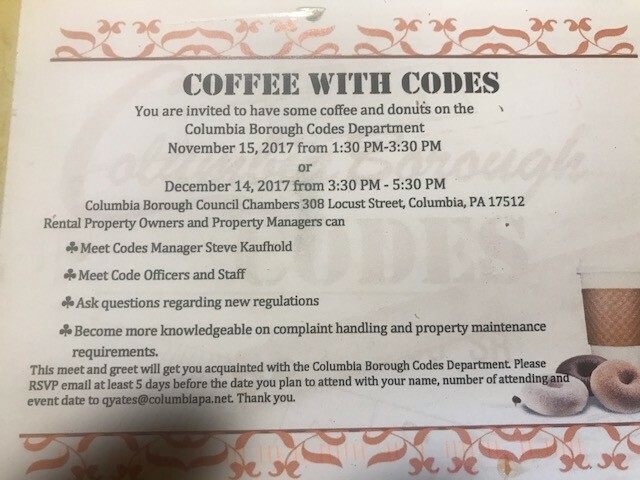 At last Monday’s borough council meeting, people in attendance learned about the COFFEE WITH CODES series of two meetings at which “rental property owners and property managers” would meet with Columbia’s codes department personnel over coffee and donuts. If you didn’t receive the invitation to attend, click on the above graphics to see the details. Wonder whether there’ll be a follow-on series of COFFEE WITH CODES for rental property residents? By definition, one might preclude that home owners in the borough appear to not be liable for Disruptive Conduct charges. I am a renter. I would be foolish to own property in Cola. High taxes, stagnant property values and the interest on a loan make it a loosing proposition. And, by thr way, I do pay property taxes; it’s part of the rent I pay. However if I can be a public nuisance by owning property, I may have to reconsider. More often then not police officers aren’t writing these up correctly to be used to enforce 3 strikes. Coffee and Codes….What a joke. They deal with renters far more then owners ot mangers. I’m sure all of those property management companies in Philly will send a representative.